History: Here we are reporting a case of 5 year old male child suffering from diphtheria induced airway obstruction, and myocarditis, who received midazolam in the form of IV infusion for sedation while undergoing mechanical ventilation for respiratory failure. 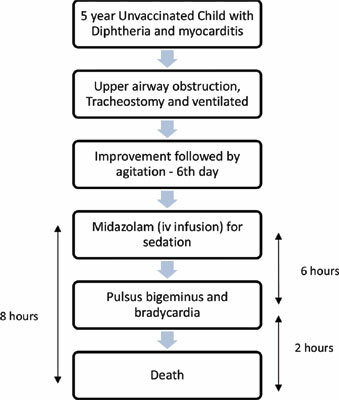 Adverse Event: Six hours after starting midazolam infusion he started developing pulsus bigeminus and bradycardia and eventual death after two hours. Conclusion: Midazolam, although considered one of the safest drugs, need to be used cautiously in a child with myocarditis, because of the possible cardiotoxic effect in an already affected heart. Cardio-toxicity, midazolam, diphtheria, pulsus bigeminus, myocarditis, bradycardia.